I just wrapped up my last email for the day...and realized it was my last work related email for the year! So fun. It's crazy to think that December is over already. I realize I say that every month...but seriously, where did it go? Naturally....I can't believe the year is over. Y'all know I love the promise of a new month...and especially a new year...but I don't want to rush these last few moments of 2016. I'm looking forward to C being off the next 3 days. We've got some fun things planned as well as some serious lounging time on the docket. Love when he is home!!! I've gotten SO spoiled to all his vacation days this month!! I've been doing a lot of reflecting this week. There have been a lot of great things that happened this year. Lots of family time and fun road trips. New experiences and new friends. 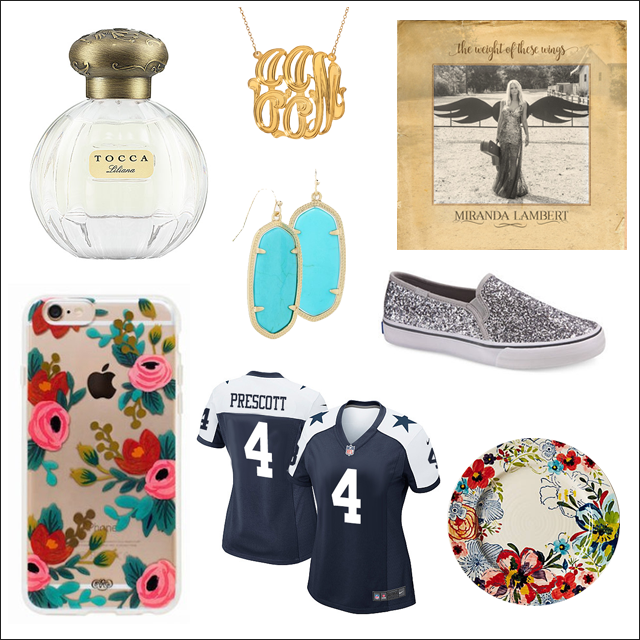 And, certainly the Dallas Cowboys are a bright BRIGHT spot for me! Ha. But 2016 has also been a difficult year - mostly of my own doing. We had some issues at the beginning of the year that I let get to me in a major way, and I never really snapped back. I just felt defeated all year long. And....I'm officially over that feeling!! 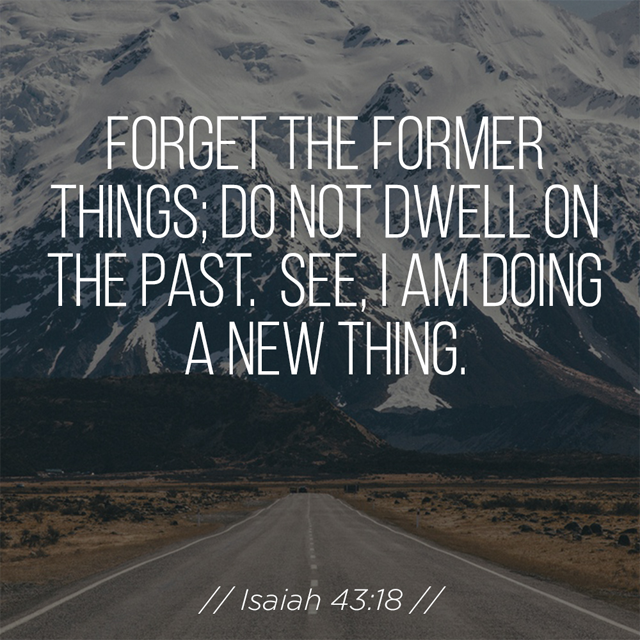 I am SO looking forward to changing things up next year. I have a tendency to make lists and get excited but then quickly lose my motivation. If you've been following my blog for anytime at all...you've no doubt witnessed this pattern. I think a lot of my problem was not really knowing what I wanted. Total lack of motivation...in just about every area of my life. I've been doing a lot of soul searching...and it's come down to asking myself WHAT I want....and then following it up with WHY. And, that seems to have unlocked an entire section of my head and heart. AND THAT IS SO EXCITING!!! 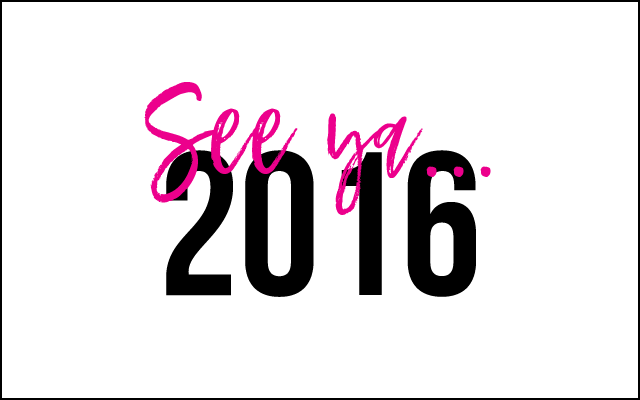 Seriously...I'm not sure how to adequately share my excitement over the changes I'll be making in 2017. Like jumping up and down giddy - excited. I can't wait!! I hope each of you has an amazing last few hours of 2016...and here's to new beginnings in 2017!! Hey!! It's Tuesday!! 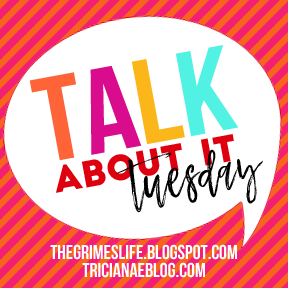 That means it's time for another Talk About It Tuesday! And apparently...it's the only day of the week I post anymore. Ha! So, we thought it would be fun to have some Christmas prompts this month...but you can always post about whatever you want to "talk about". Today's prompt is Christmas decor. Which, I LOVE. But, sadly...I'm not pulling out any of my decor this year. I KNOW...such a bummer. But we are about to move and and all of our stuff is in storage...and it's just not the year for all of that. 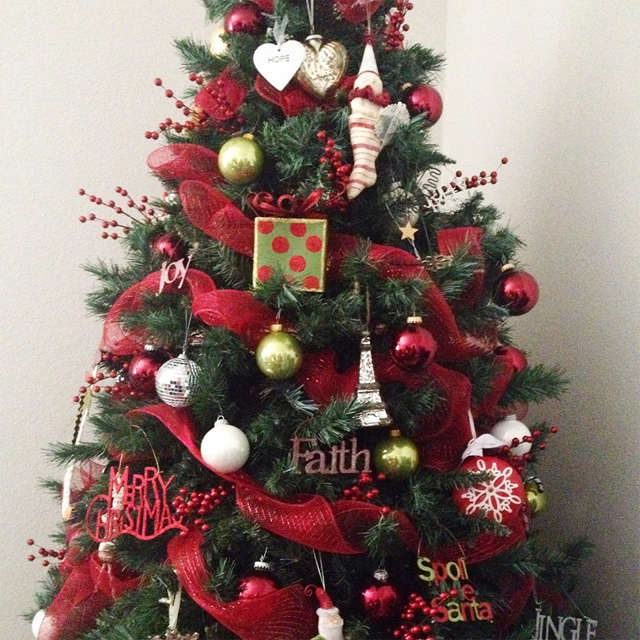 I did want to show my tree though...from last year (or maybe the year before?). I just LOVE the traditional green/red/white but with a fun twist. 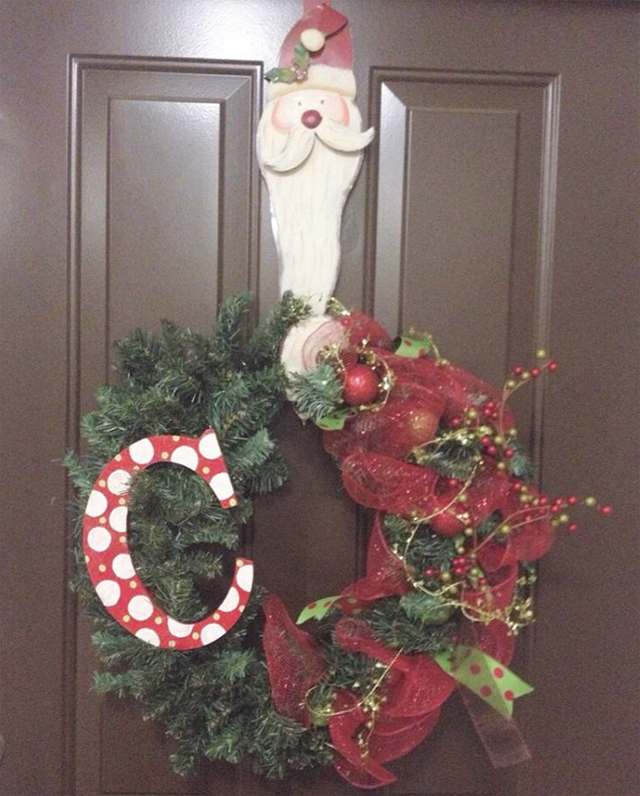 And here is my wreath. I think it needs some stuff though!! I am working on my mom's tree this week (late! )...and we are doing gold and red...so I'm excited to see how that turns out. I thought I would also show some my FAVORITE Christmas decor inspiration. If you don't follow Dina...well, you should!! SO MUCH FUN!! 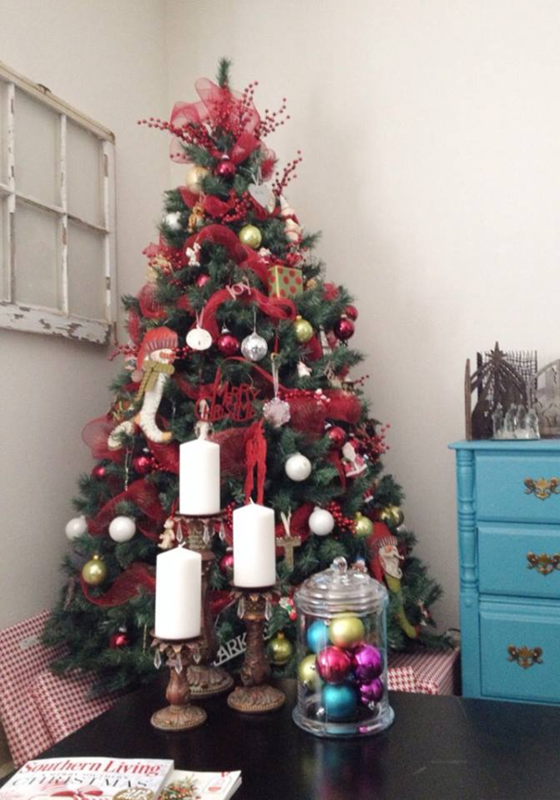 I can't wait to see your Christmas decor! And be sure to check out my friend, co-host (and marathon runner!) Melissa. 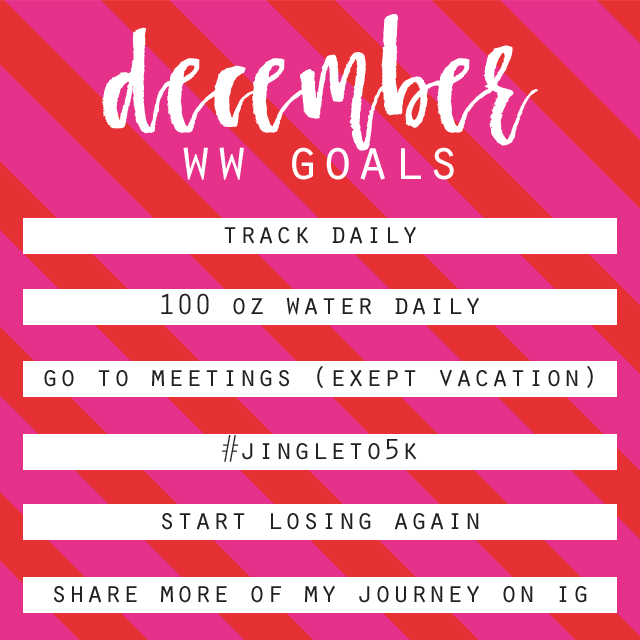 Well, now that the 2nd day of December is almost over, I thought I'd come share my goals for the month! I still can't wrap my head around the fact that the year is almost over. SO crazy. C and I were sitting on the couch (watching the Cowboys win!!!) last night and said we could not believe that Thanksgiving was a week ago. It feels like yesterday! I'm not even going to pretend that I have it together, like ever. But this year has taken the cake for being OUT.OF.CONTROL. Y'all know that The Sound of Music meme with Julie Andrews dancing in the field with the caption "this is me not caring about..."? That basically sums up my year. The dot dot dot and everything. Yikes. But...I so do not want the year to end on that note...so I'm going to try my darndest to make the most of these last twenty something days of 2016. Not great. But not awful. I did go to most of my meetings this month (except Thanksgiving week). But I'm not sure "recommit" would be something I could check off. Ha. I also failed miserably on the 30 Day Shred. Our current living situation makes this a bit tricky...and requires extra planning for space...and obviously I just didn't make that a priority. I think I read a book this month? So not a year for reading. I did get my Christmas card pictures made. Just need to get the design done! I'm putting off the 5k...maybe I'll do it this month...but for sure in January! One thing I wanted to do was make some Weight Watchers specific goals. I see a lot of girls on Instagram doing this, and I thought that would be fun. And, hopefully...motivating for me. Here's what else I'd like to do this month! 2. Make my monthly checklist/graph (and do it!). 6. Start brainstorming ideas for making 2017 FABULOUS. 8. Clean dressers and organize paperwork. 9. Get Christmas Cards done! 10. Slow down and enjoy the season!! !